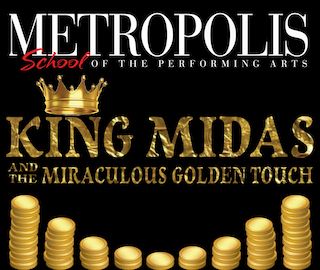 A Play Inspired by Ancient Greek Mythology, and Nathaniel Hawthorne's Story, "The Golden Touch"
King Midas is the richest person in the world, yet he is not satisfied. He wants even more gold. A mysterious stranger offers Midas the opportunity to wish for anything he desires, anything at all. Midas seizes upon this opportunity to wish that all he touches turns into purest gold. Soon however, King Midas discovers that the golden touch is not quite what he expected.